The Red Savina habanero pepper is a cultivar of the habanero chile (Capsicum chinense Jacquin). 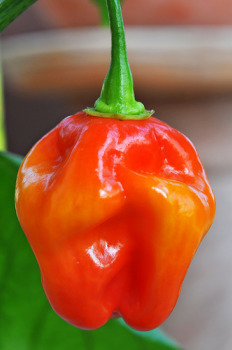 It has been bred to produce hotter, heavier, and larger peppers. Frank Garcia of GNS Spices, in Walnut, California, is credited with being the developer of the this habanero cultivar. Measuring from 350,000 to 580,000 on the Scoville scale, this pepper was formerly recognized as the world's hottest pepper. In February 2007 it was replaced in Guinness World Records as the hottest chili in the world by the Naga Jolokia pepper. 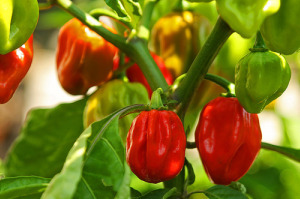 The Naga Jolokia is also known as the Bhut Jolokia, ghost pepper, or several other names. Return from Red Savina page to Chili Peppers page.